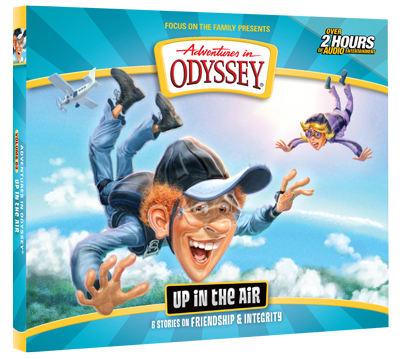 Get ready to go up in the air with the next Adventures in Odyssey album release, coming Fall 2017! Album 63, Up in the Air, the next installment in the audio series, will feature six episodes on two CD’s. In addition, fans can expect a digital download copy to be released before the CD. If you’re an Adventures in Odyssey Club member, you’ll get the first listen when it releases to club members during the summer. Things are definitely up in the air in Odyssey! First, Wooton Bassett returns from his honeymoon with two problems—Penny is missing and he’s lost his memory! While Whit, Connie, and Jason try to help Wooton find Penny, Buck Oliver rescues Jules from a crash course of disaster. And a mystery is solved only after Emily and Matthew’s friendship is threatened. You’ll learn the meaning of true friendship and integrity in six episodes of heart-changing, risk-taking adventure! As always, you’ll want to stay close by and follow us in the days ahead. We’re always there to provide the latest news on Adventures in Odyssey!